If you’re a parent, especially a working one, I bet you’re dreading the seasonal changes and the associated onset of common colds & flu. I’m already sitting with a snotty 2-year old, and before I can even say the word “tissue”, his face looks like five slugs have had a 10cm race across his face! Joy! Luckily for me I’m able to work from home so I can take care of him and make sure he gets the necessary medication and rest he needs. But I remember being in the office full-time. Flu season was disastrous! My kids always seemed to pick an EXTREMELY-important-office-meeting day to come to me with big bleary eyes and tell me they’re not feeling well. “Sniff, sniff”. 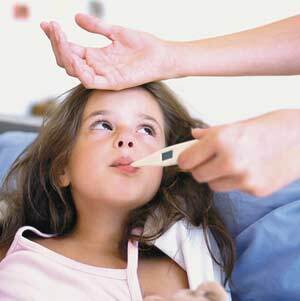 Determine whether it is in fact a cold or flu and not just a sore finger or some ploy to avoid a school assignment! If your child starts showing signs of colds and flu, address it immediately with the proper medication. Find out more about Symptoms of Colds and Flu. The best option now is to let your child take the day off school and get some proper rest. Find someone who can watch your child for the day, like a granny, friend, family member or domestic lady. Be sure to let them know what medication your child needs. If you can’t find someone for the day, try finding someone who can watch him for the morning so you can work a half-day. If there’s no one to watch your child, then make that call to your boss and take a day off work. You are completely entitled to this and should not feel bad about it (sadly so many of us do), especially when it comes to looking after your children. You have your phone for emergency purposes! And if you have access to the Internet and email at home then use that to get some work done. Your child should be resting so you shouldn’t have to run around after him all day. If there’s no chance of anyone watching your child, and you simply CANNOT take a day off work then you could take your child to work with you. This depends entirely on what kind of environment you are working in and whether your boss will allow it. The last option is to send your sickling to school. This isn’t a great option because your child needs proper rest, and they could end up making the other children sick (putting other moms in your unpleasant situation)! But this is a last resort that many of us have to take, and I have to admit that I have done it before. If you send him to school, be sure to keep your phone close by; you might get a call from the school requesting that you take your sick child home. Make sure you guard yourself against any viruses by taking immune boosting supplements. Read 13 Ways to Avoid Colds and Flu for some more useful tips! If you have any comments, questions or suggestions that could also help working parents deal with sick kids, please share them with us. We’d love to hear from you!